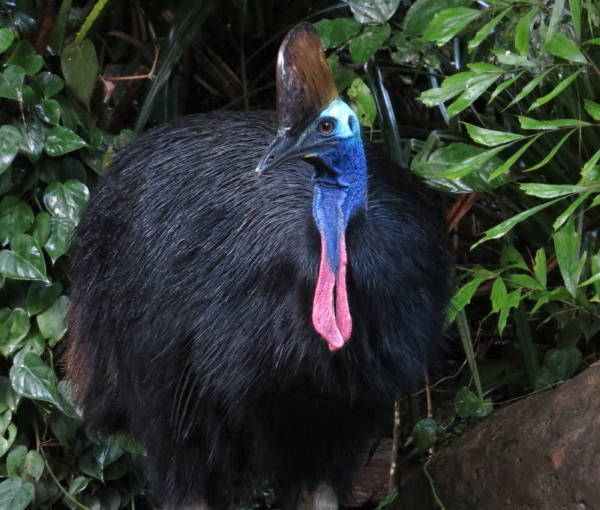 Recently a new female cassowary moved in, and she seems to have filled the vacancy left by “Missy”. Her wattles have a distinctive shape, and we decided to call her “Socks”. She still has a few brown tail feathers, but is already bigger than the resident male, “Dad”. Our guess is, that she is about 3-4 years old, and this might well be her first mating season. He is definitely interested in her: initially, he frequently made soft contact calls (similar to a chimpanzee’s or gorilla’s grunting), while standing several meters away from her. She pretended not to be interested, having her back turned to him. As soon as she started to slowly approach him, he got scared and took off like a chased Brush Turkey, protesting loudly. You can identify the male by his longer tail feathers. ‘Dad’s’ casque tilts to the right, whereas ‘Sock’s’ is straight and unblemished. You can also make out a dash of brown on her backside. Nevertheless, he can’t stay away from her, and the whole scenario kept happening again and again. For a while, you had to be careful in the garden, as Dad might come crashing through the forest or across the lawn at high speed! Now, after several weeks of travelling together (but at a safe distance from each other), she readily follows him, but he still gets spooked when she gets too close. Probably hormone levels have to rise for mating behaviour to start. 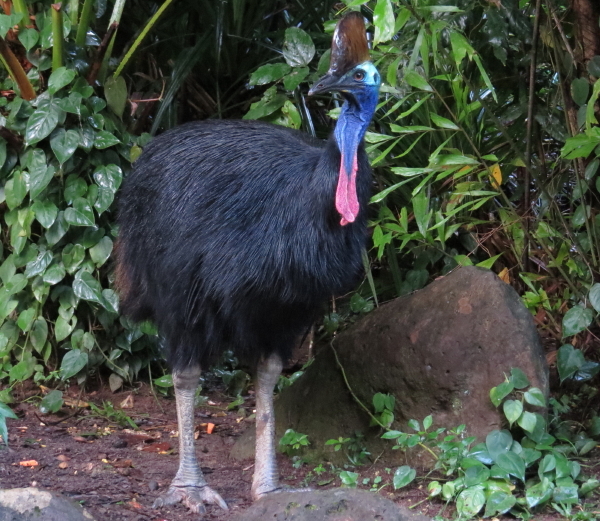 Hopefully, we’ll have a new generation of cassowaries visiting later in the year!